Anybody picking Khabilov over Henderson? Discussion in 'UFC Discussion' started by SUBLIME FAN, Jun 7, 2014. I actually think he'll do pretty well, and I won't be shocked if ge gets the win, but overall I'm picking Bendo. Any of you guys picking Khabilov? When Bendo loses, he wins, so no. I'd be surprised if Benson wins. He wont be able to keep up with Kalib's rythem. I am picking Khabilov. I honestly think he will dominate Bendo. Me. I've never been 100% certain with bendo for some reason. I've been saying it since this fight has been announced! Khabilov is going to school Henderson imo, I could be wrong but I think his Wrestling/Sambo is going to be to much for Bendo to handle! Guess we will find out tonight, I'm hoping he beats him soundly but this is mma so you can never be really sure. I hope Khabilov wins, cant root against fellow europeans. I'm picking Khabilov. 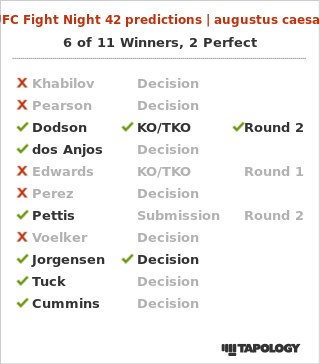 I feel like it'll be the first round of the Josh Thomson fight for 5 rounds. Already responded but wanted to add that I think Khabilov will be champ eventually, dude has amazing skills and talent! Benson will win, but I hope I'm wrong and Rustam pulls the upset. You have been very confident all week, I hope that we're right. For not even knowing his name, you've sure drank a lot of the kool aid. I think Khabilov is going to pull off the upset, I think his pressure style and better more powerful hands along with his grappling is going to give Henderson problems. It could go either way though I am leaning towards Khabilov.